MANILA, Philippines – The threats to democracy in 2018 have been imperceptible, gradually chipping away at institutions designed to strengthen and protect it. The trend has been global: backsliders and emerging democracies have slipped back, showing early indications of authoritarian tendencies. Besides the Philippines, Thailand, Turkey, Venezuela, and Brazil are just some of the countries that have slipped in terms of democratic gains. Thailand – under a military junta since 2014 after the elected government of Yingluck Shinawatra was ousted in a military coup – will hold a general election in February 2019. There are fears the authoritarian government will acquire legitimacy if the junta leader will serve another term, this time as an elected prime minister. Turkey’s Reccep Tayyip Erdogan has consolidated political power and tremendously weakened independent media, locking up lawmakers and journalists alike on spurious grounds of being alleged threats to national security. In Venezuela, President Nicolás Maduro, who has been in power since 2013, has taken full control of Congress and quelled anti-government protests. Recently, he claimed that the August drone attack against him was ordered and authorized by the White House. This has been denied. Eyes are on the world’s 4th largest democracy, Brazil, after the presidential victory of Jair Bolsonaro, a far-right populist who will assume office on January 1, 2019. His homophobic declarations and promises to ease restrictive gun control laws have signaled the worse may yet come. The striking parallelisms between Trump and Philippine President Rodrigo Duterte have not escaped many. Both the tough- and trash-talking presidents have intended to intimidate critics and independent media alike, using social media and a well-financed propaganda machine. After ousting the dictator Ferdinand Marcos in 1986, the Philippines is gradually inching its way back towards authoritarianism, aided by Duterte himself and his supporters. Democratic institutions have been severely compromised by actions cloaked with specious constitutional legitimacy. Legal cases have been hurled at lawmakers critical of Duterte – Senator Leila de Lima and more recently Antonio Trillanes IV. He has openly threatened the Office of the Ombudsman and the Commission on Audit, and his Solicitor General had successfully instigated the ouster of former Supreme Court justice Maria Lourdes Sereno, an appointee of former president Benigno Aquino III. He has openly attacked critical media – the Philippine Daily Inquirer, ABS-CBN, and Rappler. A barrage of cases have been lobbed at Rappler’s parent company, Rappler Holdings Corporation, and CEO and executive editor Maria Ressa. From revocation of Rappler’s license due to alleged ownership issues (this has been refuted), other cases have included cyber libel for a story published before the cyber libel law was passed, tax evasion for alleged income from the issuance – not sale – of Philippine Depositary Receipts, and alleged violation of the anti-dummy law. These attacks on the ground have been complemented by attacks online made worse by what appears to be state-sponsored disinformation. The extrajudicial killings carried out by vigilante groups contracted by the police have not ceased; the number of dead in the brutal campaign against drugs continues to rise (at least 5,000 in police operations and no less than 20,000 in vigilante killings) even as drugs have continued to penetrate the streets, slipping past the supposed watchful eyes of law enforcers. 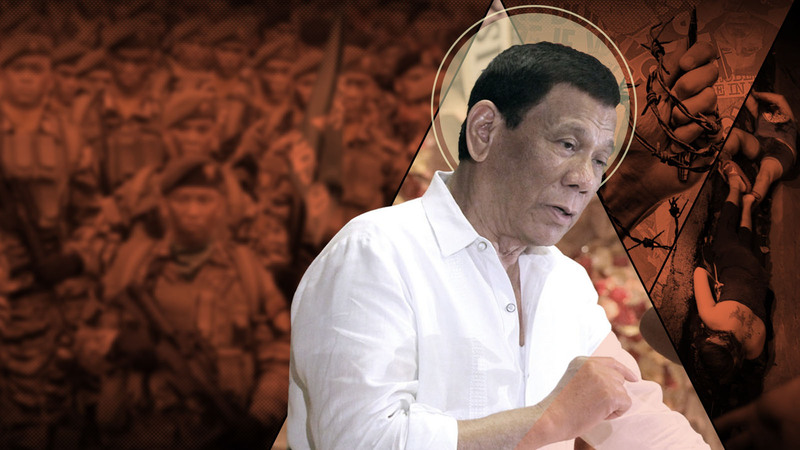 Appointments by Duterte of ex-military officials have only served to burnish perceptions of creeping authoritarianism and declining standards in the rule of law. This has not gone past observers worldwide, as reflected in various global rankings of the country. For instance, the World Justice Project Rule of Law Index tagged the Philippines as the “biggest mover,” falling 18 positions to 88th out of 113 countries from 2016’s 70th place. The country also ranked 5th among countries where the murders of journalists are left unprosecuted, according to the 2018 Global Impunity Index of the Committee to Protect Journalists. Newsbreak, Rappler’s research and investigative arm, has pursued stories to track this slow but steady descent to authoritarianism, in a bid to stem it and call attention to this worrisome trend.